Kids love cupcakes…okay so do adults, LOL. 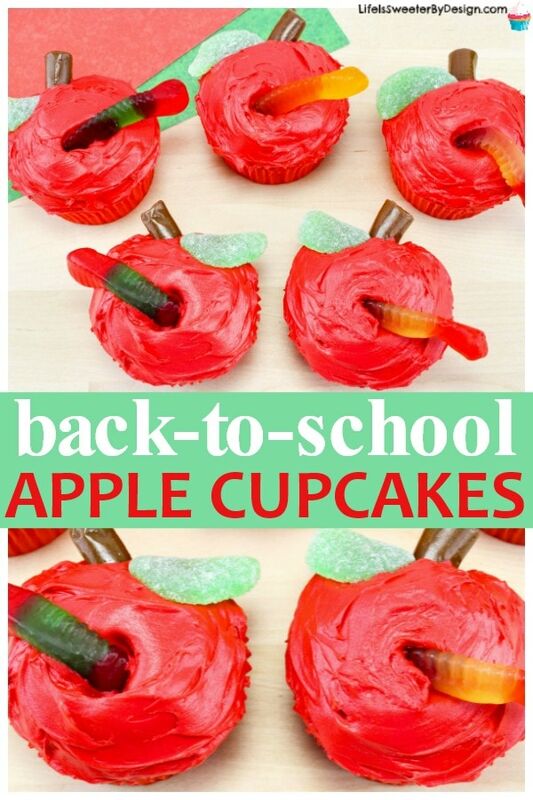 What is cuter for back to school then apple cupcakes with an adorable worm! This is the perfect treat to make with your kids and send to school to share! It is so fun to take a simple cupcake and make something so so cute. 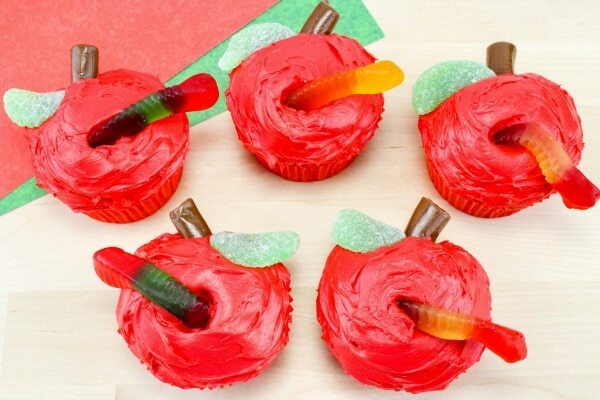 These apple cupcakes will make any kid (or teacher) smile for sure. They are also perfect for FALL themed apple parties! Start off with some white or yellow cupcakes that have been baked and cooled. Take your red frosting and frost each cupcake with a thick smooth layer. Now grab the Tootsie rolls and cut each one in half lengthwise. 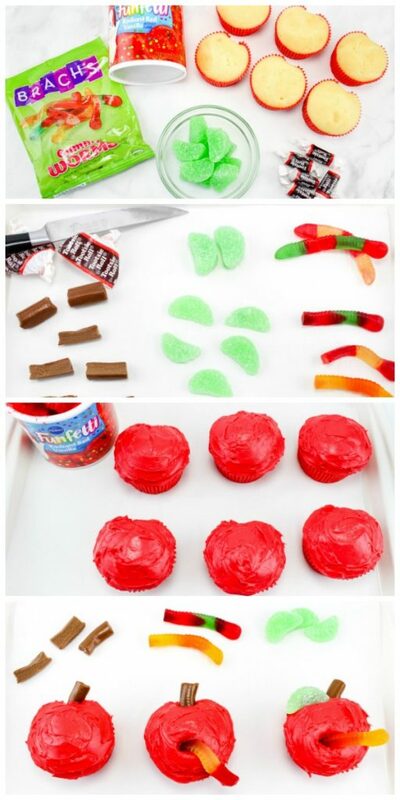 Put each Tootsie roll piece into the upper right corner of the cupcake so that it looks like an apple stem! Now it is time to cut the green fruit slices in half lengthwise and place them on the cupcake near the stems so that they look like little apple leaves. It is time to get the worm ready. Cut about a 1/4 off of one end of the gummy worm . Then push the cut end down into the cupcake so that looks like the worm is popping up out of the apple. If you want to get really specific you can make a little indent in the cupcakes so it looks even more like an apple. Pour the cupcake batter into cupcake liners in your cupcake pan . Then take a small piece of rolled up foil between the pan and the cupcake liner. This will cause it to bake with a small indention just like an apple top! 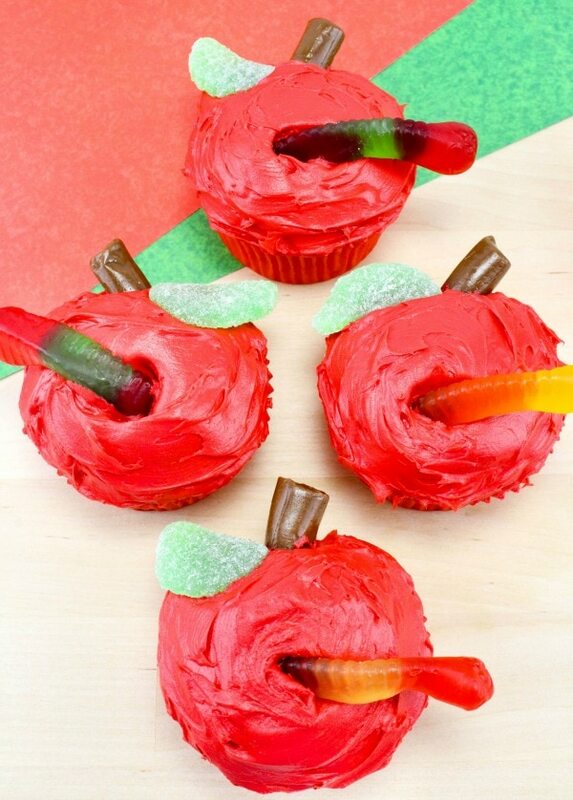 These apple cupcakes are absolutely perfect for a fall party at school or at home. There are so many adorable apple decorations to make the party even cuter. From an apple banner to apple balloons there are tons of options! Let me know what occasion you are celebrating when you make these apple cupcakes! 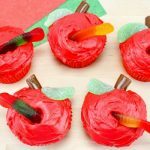 These Apple Cupcakes with a worm are perfect for school parties and fall! Easy to make and kids will love them. Frost cupcakes with a thick smooth layer of frosting. Cut each tootsie roll in half lengthwise. Stick one into each cupcake at the top edge right above the cupcake paper so it looks like an apple stem. Cut the fruit slices in half lengthwise and place one on top each cupcake near the stems so it looks like an apple leave. Cut about a fourth off one end of each gummy worm. Push the cut end down into the top of each cupcake a little way into the cake. Make sure the worm is hanging out of the frosting, so it looks like a worm coming out of an apple. Optional Step: When preparing my cupcakes, after my batter was in the cupcake liners in the pan, I stuck a small piece of rolled up foil between the liner and the pan. This will make the cupcakes have an indent on one side, so it looks like an apple shape. These cupcakes are perfect for fall parties and school events!